I’m thrilled to announce that the next book in my Busy Writer’s Guides series is now available! Building a thriving social media platform doesn’t have to steal all your precious writing time or cut into your time with your family.Twitter for Authors is about building a successful Twitter platform that’s sustainable for busy people. Due to popular demand, I’ve made Twitter for Authors available in both print and ebook form. 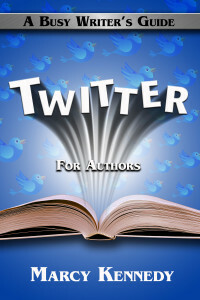 You can buy Twitter for Authors at Amazon.com, at Kobo, or at Smashwords. More sites will be coming soon! The ebook is priced at $2.99 at Amazon.com and the print version costs $12.99. Twitter often gets a bad rap by people who don’t understand it, misunderstand it as full of spam and celebrity stalkers, or don’t know how to use it to its full potential to build an author platform. When used correctly, though, Twitter can be one of the best tools for meeting new readers and increasing traffic to your blog. Not to mention it’s fun! Don’t believe me? Well, let me prove it to you then. I have seven reasons why I think every writer should be using Twitter. Reason #1 – Twitter has over 100 million active accounts and growing. Whether you’re seeking traditional publication or plan to self-publish, whether you’re a non-fiction author, a novelist, a poet, or a short story writer, you need a platform to sell your work. Your readers are on Twitter. You just need to know how to meet them. This is true even if you write children’s books or YA. If you write for kids, your readers might not be on Twitter, but their parents and aunts and uncles and even grandparents are, and your books might just be the perfect gift they’re looking for. Reason #2 – Twitter allows you to build a following faster than any other social networking site. People who find you on Facebook usually already know you. People who find you on Twitter are more likely to be complete strangers (at first) because of the ability to participate in conversations through hashtags. Reason #3 – Twitter makes you a better writer. Twitter gives you 140 characters to work with. Not 140 letters or 140 words, but 140 characters. Spaces count, and so does punctuation. Links count as well. Working within those constraints forces you to write tighter. No purple prose allowed. No weak verbs modified by adjectives. You need to figure out exactly what you’re trying to say. Those skills translate directly into better writing elsewhere. Reason #4 – Twitter brings you the news faster than any news site can. Twitter is real time, which means that while reporters are putting together their stories and getting approval from their editors, normal people on site are tweeting. In August 2011, Twitter lit up like a firefly on crack about the 5.8 earthquake in Virginia before the news stations could catch their balance. My husband and I were able to call my mother-in-law right away to make sure she and the rest of the family there were safe. In the plague of tornadoes that rolled through Texas in April 2012, Twitter might have even saved lives. So many tornadoes hit the Dallas area at once that meteorologists couldn’t keep up, even if people still had electricity and the ability to check their television, use their computer, or tune in on the radio. But what everyone could still do was tweet using their phones. People banded together to warn others and report sightings, keeping all involved safer than they could have been alone. Reason #5 – Twitter allows you to keep your finger on the pulse of the publishing industry. Twitter is like a writer’s mecca because you can quickly find out about interesting and informative new blog posts (already vetted by others), get tips on writing and publishing from agents, editors, and bestselling authors, and keep up on industry trends and new releases. No searching involved. It comes to you in a bite-sized 140 character nugget. If you decide you want more, you click the link. Reason #6 – Twitter helps you research. In her bestselling book We Are Not Alone: A Writer’s Guide to Social Media, Kristen tells the story of how she needed information on bounty hunters for her novel. Rather than wasting hours trying to sort through results on Google and still not coming up with what she needed, she tweeted about it and received replies from actual bounty hunters willing to answer her questions. In my co-written novel with Facebook expert Lisa Hall-Wilson, we mentioned Sodom and Gomorrah, and we debated whether enough people would know what we meant. So I asked, and we ended up leaving it in the book. Reason #7 – Twitter gives you a support network of friends. I’ve left this to last because, to me, it’s the most important. Writing is solitary. We sit at our computers and play with our imaginary friends. Which is great, but also leaves us without the support network we need if we want to make writing a long-term career. On Twitter, you’ll find someone to talk you down off the ledge when one too many rejections or poor reviews leave you wanting to quit writing altogether. On Twitter, you can make writers friends who’ll run word sprints with you to help you keep on track. On Twitter, you can make reader friends who’ll be excited to go out and buy your book and tell everyone about it. Twitter is like the workplace water cooler. Come, chat, and get back to work. It doesn’t take all day to make Twitter a valuable place to be! If you’re not on Twitter yet, what’s holding you back? If you are on Twitter, what do you struggle with? And if you’re on Twitter, make sure to leave your username in the comments so we can all follow each other! 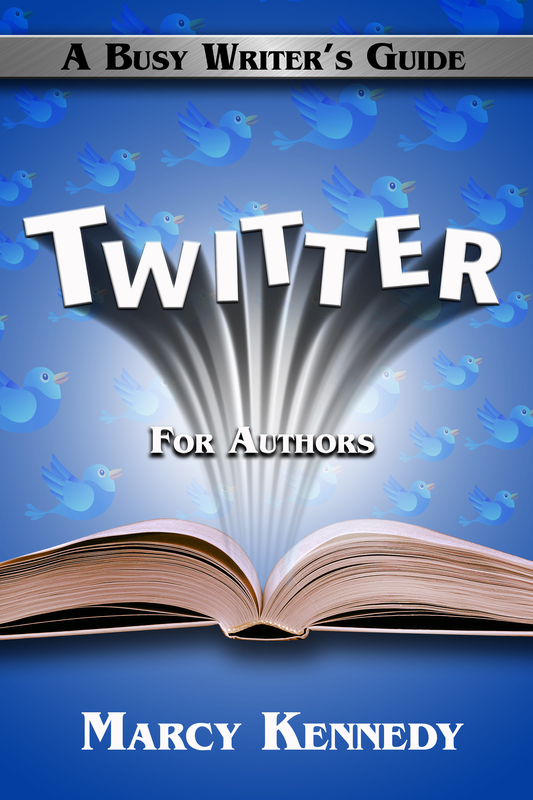 You can buy Twitter for Authors at Amazon.com, at Kobo, or at Smashwords. Like Emma, though, sometimes I struggle with the socializing aspect of Twitter. If I can’t think of anything to share beyond writing, tea, sharing articles (either mine or someone else’s), reading, music, or something else that excites me, I can sit there for several minutes trying to think of what to say. I’m also hesitant to “jump” into other Twitter conversations. I’ve heard long-time Twitter users encourage it, but it’s not something I’m used to doing in real life. (It might be my introversion kicking in…) Would you have any suggestions about that, Marcy? Jumping into ongoing conversations is completely acceptable on Twitter and it’s a great way to socialize. It’s something I wouldn’t do in real life either (so I get where you’re coming from on that one), but it’s a great way to connect with people on Twitter. Since you’re writing fantasy, you can also find the hashtags for some of the fantasy shows that are currently on TV (if you watch them). Try tweeting while you’re watching. It’s a fantastic way to connect with people who enjoy the same things you do. Bought the book. Can’t wait to read it. I am on Twitter but I know I could get more out of it. Congrats, Marcy! Just tweeted, looking forward to reading it and getting more tips!